Multimedia Reporter, Producer. Formerly with CNN, CNN International, Al Jazeera America. As a journalist, you're trained to be objective. Your sole responsibility is to report with accuracy and fairness, and to never get emotionally involved in the story. In my craft, detachment is the code of conduct; but my human sympathy was deemed antithetical to my professional guidelines. I've covered the Syrian crisis intimately. From the front-lines of the conflict overseas to newsrooms in the States, I've seen it far too close to smell the blood and far too distant that only rough contours emerge. Each day, whether in the field, roaming the borders of Syria in Lebanon, Jordan, and Turkey, or behind my desk back home in America, I was able to objectively report and produce on this profound crisis. I've told stories of misery, wreckage, and havoc--all from the vantage point of those directly affected by the charnel house that is Syria today; and of the chaos of neighboring countries bearing millions of refugees who are running from a seemingly endless war that's about to enter its sixth year. That is my job--a craft I respect with every fiber of my being--a form of public service necessary for a democracy. This draining profession is at its most challenging when one faces such grim circumstances. The work of a journalist is very important; but for me covering Syria turned into a struggle in keeping the conflict at arms length. Something happens when you see the mayhem too close and realize that there is no immediate solution for any of the carnage--the carnage of people, humanity, and a future generation of a nation and a devastated region. My information and knowledge of the humanitarian necessities were no longer limited to daily media analysis or agency reports sent to my email each month; they were in my heart. Local Lebanese NGO helps distribute blankets among Syrian Refugees in Baalbek, Lebanon. In just one week I met a dying mother, whose three sons witnessed her harsh battle with cancer. UN agencies were not able to provide her with medicine. She laid on a thin blanket on the bare floor of a tent near the northern borders of Lebanon. I've seen a man with three wives--all living in one small tent with six children. The younger wife--only 20 years old-- opened up to me and told me what no woman should bear; "when my husband gets angry, he beds the other wife next to me and makes me hear him--it's painful." said the young mother. She was married off to this man in her camp. Her father could no longer afford supporting her. I've seen a mentally ill 13-year-old boy who could not stop smiling, but would not understand me. He went mute after a sequence of bombings in his hometown of Homs last year. I've seen a half-blind 12-year-old from Daraa--the city many believe to be the birthplace of the Syrian civil war--who told me he wants to be in school, but is afraid. He told me he saw a teenager from his camp stab another boy with a knife--and that he does not want to end up like him. I've seen a 6-year-old boy and his 4-year-old sister selling walnuts on the corner of the street. I've seen children who have not showered in three weeks. I've seen children who smoke in tents. I've seen naked toddlers running on dirt roads as their mothers work in the city--the kind of jobs no woman should do--all in hopes of bringing their babies some food or clothing. I've seen so much in so little time. I witnessed humanity at the brink of destruction and felt the need to take action. 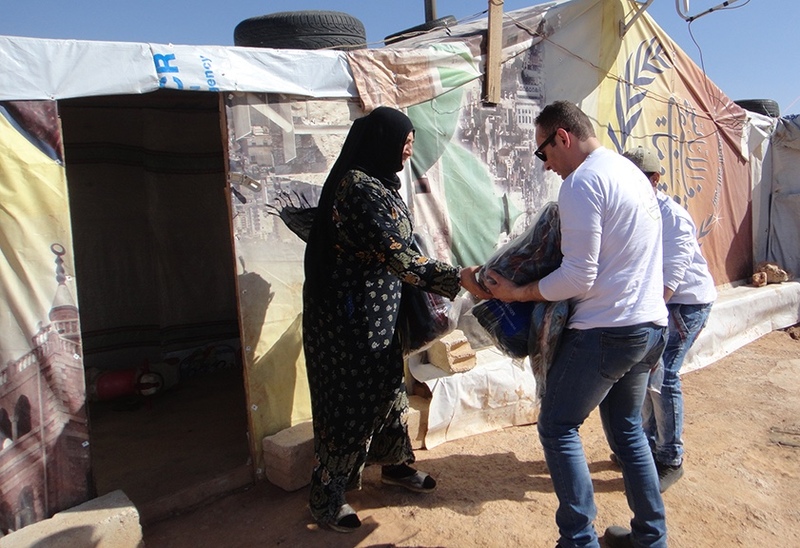 In one month--starting in January--on my spare time, I managed to raise funds for about 800 blankets and distribute them among four un-official refugee camps I visited near Arsal, Baalbek, and Lebanon's Beqaa valley. 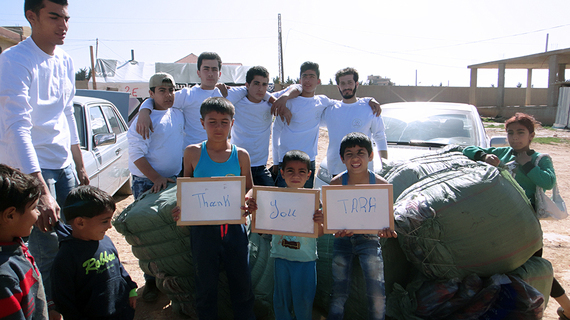 I knew and trusted the local NGOs to fulfill the mission; and could not resist lending a hand to ease the suffering. For those of us on the outside, 800 blankets may seem like a drop in the sea; but not for those in need. 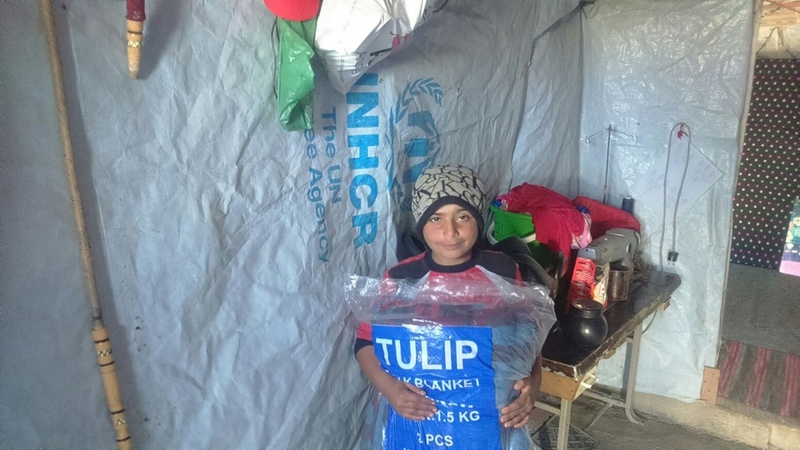 For a cold child, even one blanket can be the difference between life and death. This is just one humble example of how we can ALL raise our hands and take action. Syrian refugee boy receiving blankets sent through fundraising led by journalist Tara Kangarlou in Lebanon's Beqaa Valley. As a young woman, I can't forget the smiles of those children who had lost their parents and smelled dead bodies; yet somehow, their playfulness and bloom of childhood remained. I can't forget how the children wanted to hold my hand and play with my hair. I was also told many of them don't eat anything chewy or what they perceive as "meat"--not that they do get to see much meat--but if they do, they refuse. The odor takes them back to the death and carnage they bore witness to in their backyards. I saw locals in host communities trying their best; I saw locals turning their backs; but I saw them on the front-lines of this flood--they too are at risk. Syria today is the world's largest producer of internally displaced people and refugees. It is the largest humanitarian crisis since the second world war. Today, over half of Syria's population of 22 million are affected by this futile war--over 10 million are internally displaced and over 5 million are spread through neighboring countries with one million asylum seekers flooding into Europe. Forty percent of the entire Syrian population is under the age of 18 and more than half of the refugees are under the age of 11; and these are just the official numbers. Yes, international journalists, foreign correspondents, and war reporters, will all have similar stories--perhaps even more gruesome tales based on their experiences and years in the field. But the killing field that is Syria today is a test of humanity and empathy for us all. This winter, as we brave the cold weather indoors, stack our pantries with food, and worry about another blizzard hitting the East Coast, I could not bear the thought of another child's death as a result of cold weather in their damp bare tents--in the camps that I was fortunate enough to spend time in during parts of this past year. Journalist or not, at a time when my conscious--our global conscience--is tested, we can not afford to fail. This is not a multiple choice problem, but a simple question that can be answered by us all. Similar initiatives to my modest effort can start small and grow--anyone and everyone can help. What one may consider a futile act is quite definitely not, especially to those struggling to survive on the receiving end. Local Lebanese volunteers with Syrian refugees after distributing blankets. 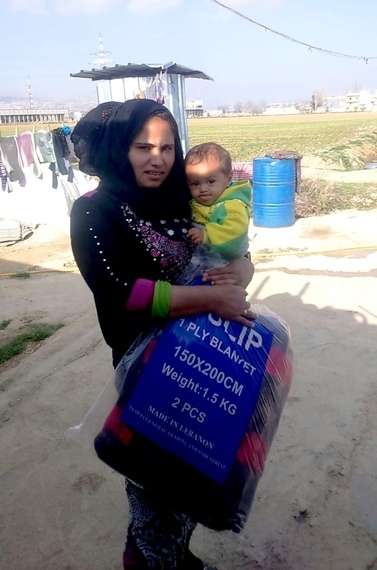 Syrian refugee mother and her newborn child after receiving donated blankets in Zahleh, Lebanon. 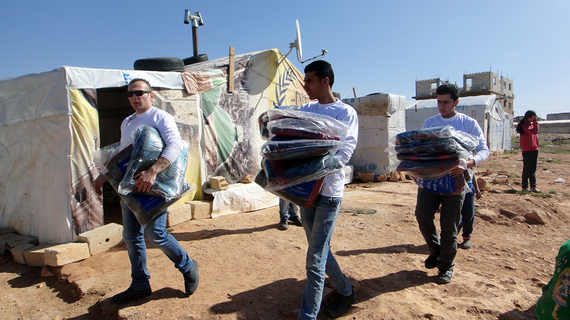 Local Lebanese NGO, "Lebanese Youth Network" distributing donated blankets among Syrian refugees near the Lebanese/Syrian border in north-east Lebanon.